This is my Soundcloud Playlist of 105 individual song tracks I wrote and recorded back in the late 1980s and 1990s. I’d always wanted to write songs, and over the course of a few years wrote over 250 songs, and recorded less than half. I’m not much of a singer or musician – and only aspired to be a songwriter – but it turned out that I needed to play and record demos of my songs myself in order to give life to them, no matter how limited my talents were. My hope one day is to write more songs, but years ago I gave away all my instruments and equipment to an aspiring musician for his church music group, so we’ll see how I find my way back to writing music. Earlier, I introduced you to the first verse and chorus of a song of mine titled, England, written while returning from my flight training at Cannon AFB, NM, where I learned to fly the F-111G ‘Aardvark.’ In the fall of 1991, after the first leg of my return flight took me to Dallas-Fort Worth, TX, and while waiting for my overseas connecting flight to London, England – I began jotting down a few lyrics that came to me in the airport so I could later finish the song. On my flight to London I asked the flight attendant for some paper and a pen which she graciously brought to me, and I continued working on the song’s lyrics. At the time I was longing to return home to England and see my family again after being away for over three months at Cannon AFB, NM, in the southwest of the United States. I couldn’t wait to see something green again, and return to the Old World – where most everything was quaint and picturesque – with stone walls, thatched roof cottages and church spires that had withstood the test of time. 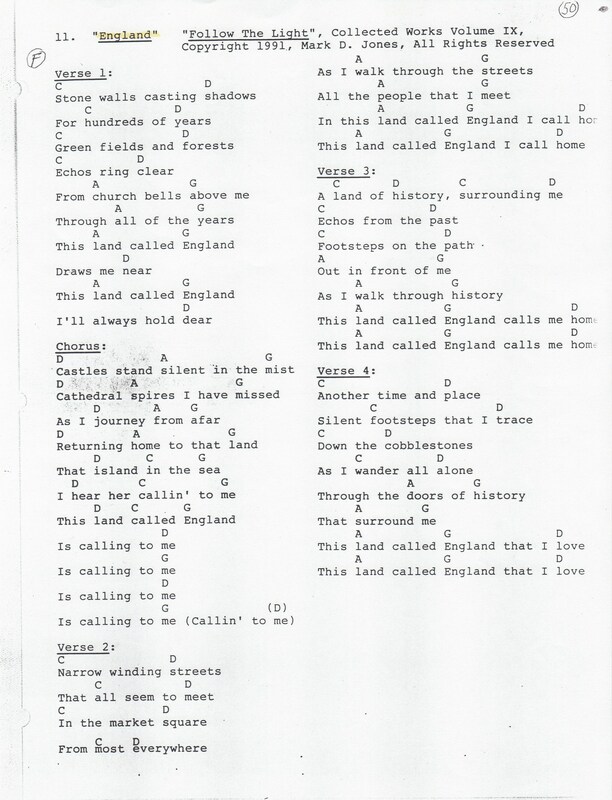 So without further ado, here’s my original song, England. The nature of this song is slow, with feeling and reverence. If you were to conceptually film a video of the song, the singer(s) would walk through a historic market square – while black and white transparent images of people in period costumes from hundreds of years of English history would be passing by and greeting them in the streets. This song is dedicated to all the wonderful folks of the United Kingdom who have been so hospitable to me during my: solo bicycle adventure in 1979, while on Temporary Duty with the U.S. Air Force, while visiting on vacation, and while permanently stationed in the UK with the U.S. Air Force for almost eight years. You have given me so much more than I could ever give back to you in return! This song is a small token of my appreciation for your care and concern for me as my hosts during my delightful stay in your very pleasant and green land! I’ve released my personal Copyright rights to this song as a way of saying ‘Thank You’ for the memories and for the wonderful hospitality you’ve shown me and my family!